Because who doesn't love free stuff and doubled dinero? Everyone this side of the Mississippi is clamoring for Red Dead Redemption 2, but let's not forget Rockstar's other perpetually popular moneymaker, GTA Online. In its latest update, bearing the alliteration-tastic title of Southern San Andreas Super Autos Inventory, GTA Online debuts four new whips for purchase, two free unlocks for anyone who logs in this week, and a host of double-value events that can help you rack up GTA$ quick. Let's get the titular autos out of the way first: the Benefactor Serrano, Karin BeeJay XL, Fathom FQ 2, and Emperor Habanero (best name) are now available to add to your garage, courtesy of your local Southern San Andreas Super Autos. Sure, those gas guzzlers are all well and good, but they pale in comparison to what you can get for free by logging in to GTA Online between now and September 17. Up top, you can behold the majesty of the Sessanta Nove Multi-Color Livery for the Mammoth Avenger (which vaguely reminds me of Pharell's Billionaire Boys Club clothing line), so you can take to the skies looking like the flyest pilot in town. For anyone who adores the nightlife, the complementary Gefängnis T-Shirt is the perfect centerpiece for your nocturnal rave outfit. More money-minded folks will want to jump into the chaotic Trading Places (Remix) mode this week, which is currently doling out twice the GTA$ and RP. If you've never played it, it's a bizarre skirmish pitting a team of minigun-wielding Juggernauts against Teen Wolf-looking Beasts who can superjump onto buildings in a single bound, as you switch roles over the course of a match. Other bonuses include doubled amounts of contested goods in Business Battles, as well as double Popularity Boost for completing. Nightclub Management Missions. It breaks the doubling rule, but Gunrunning Research & Manufacturing also gets a 25% speed boost. 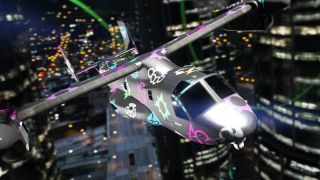 In addition to all these generous perks, you can check out a full list of vehicle, gear, and nightclub discounts in Rockstar's official blog post outlining the update. But long story short, anyone looking for an excuse to jump back into GTA Online should do so now, because who knows if you'll ever be able to score the Sessanta Nove Multi-Color Livery again. If you're in need of even more GTA$ this week, be sure to read our guide on how to make money fast in GTA Online.